The Village of Nashotah was incorporated in 1957. Prior to that, Nashotah was an unincorporated part of the Town of Delafield and was a popular destination for train travelers. Nashotah is home to the Red Circle Inn which is the oldest restaurant in Wisconsin. According to the latest census information, the current population is 1366 with approximately 968 persons of voting age. 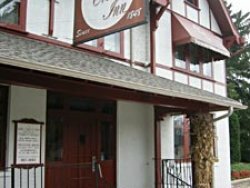 Home to Red Circle Inn, Wisconsin’s oldest restaurant, which opened in 1847 and started out as a stage coach restaurant.